Preheat the oven to 350 degrees. Butter a large cookie sheet. In a food processor fitted with the steel blade, pulse the pecans until they are finely chopped. Add the powdered sugar, flour and salt, and pulse again. Scrape down the sides of the bowl with a spatula if necessary. Drop in the butter and shortening chunks, and pulse a couple of times. Add the egg and pulse again, just until the mixture starts to come together. Roll the dough into 1- to 1 1/2″ balls with your hands. Place the balls on the baking sheet, spacing them 1″ apart; give them a light pat on the top. Bake until the cookies are golden brown, about 15 minutes. You may need to bake two batches. Generously, really super generously, dust extra confectioners’ sugar over the top of the cookies. do I really need the shortening, or can i use all butter? You can use all butter as well, Yvonne. Enjoy! Hola!!! Me encanta como cocinas pero me gustaría que tus recetas también las escribieras en español. La verdad no entiendo muy bien el inglés! ☹️ Gracias! Y Felicidades por todas tus creaciones! Pati thank you for your recipe! I’m making these especially for my mom. These are her favorite cookies! I finished baking 25 dozen last night now one more batch just for my mom! Thanks again! Say hi to your mom for me Natalie! I like to make mine without vanilla…but you can always adapt the recipe to your taste, Lourdes. Enjoy! Hahaha…yes there aren’t too many leftovers ever in my house either, Yolanda. Say hi to your daughter for me, Kathy…and I hope you both love the cookies. They’re better if you just use butter. Love you Pati! I’ve been making these every Christmas for 40 years or more. We started calling them Russian tea cakes because my family was from Russia/Poland area. They made them there. Now that I have a grandson, to make it easy, I just call them Snow Balls. There’s nothing better at least to me and my family. Now my Grandson William helps me roll them out. He’s 7. Oh say hi to William for me, Donna! And thanks for sharing all of your names for them. I have a question. Do you weigh your flour? If not then I won’t weigh it. Oh I just use a measuring cup. I am so happy to find this recipe for these wedding cakes. When I was in high school we made them in our home economics class. I love them and lost my original recipe. Going to the store tomorrow to get the ingredient that I don’t already have so I can make some. That’s awesome that you made them in high school. I hope you enjoy this recipe, Annette! My favorite cookie. The sweetness is just right. Love your show, glad l found it. I’m so happy you found the show too! I’m sorry you didn’t like it Rosa Maria. I had to use a hand mixer and made a mess, but the turned out wonderfully! I’m so glad I found this recipe! I’m so glad you found it too, Sami! Always delicious! These are powdery and don’t harden like the recipe I use to have. Me encantan! Se los mandó a mis suegros . Hi Patty, can I make the dough ahead of time and refrigerate for later.? Love your show! 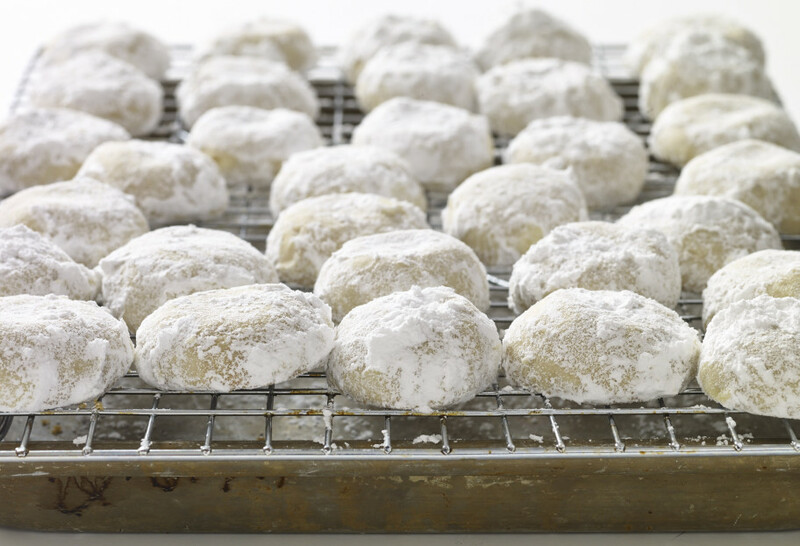 The cookies will actually keep for a couple weeks covered in your kitchen…and they will keep even longer if you store them tightly in plastic bags (with no air inside) in the freezer, just thaw them a day ahead. So you can just make the cookies all the way through ahead of time. Es un sustituto de la grasa vegetal para la manteca de cerdo, pero puedes usar mantequilla o manteca de cerdo. I love those cookies, we call them las galletas de tata chema. Me hiciste recordar a mi abuelito (tata) he used to bake those cookies for us all the time, I will make them for this Xmas to remember him and those magical times together. What a beautiful memory, Susana, thank you for sharing! I don’t have shortening, I have lard. Can I substitute or should I double the butter? Hello Pati, what’s the difference between confectioners sugar and powdered sugar? All of your recipes are AMAZING! Can’t wait to try this one! Thanks for making cooking mexican food fun again! Recipe says drop in butter and shortening chunks, is it 1/2 cup each or did that mean butter OR shortening chunks? It is 1/2 cup of shortening and 1/2 cup of butter. Or if you don’t have shortening, you can use 1 cup of butter. Sometimes we put lime zest in them. The kids at my girls school love them! Oh that is a delicious addition to them! Sarai, if you don’t have a food processor, put the nuts in a bag and pound with a rolling pin. Works perfectly. I love that you posted this! I grew up calling these bischochos or bischochitos, but yes… we had them at every wedding. What if I don’t have a food processor? What can I use? You can use a blender…or you can chop and mix by hand. I also call them polvorones. Love polvorones. Will try this tonight. Gracias Pati! !